Five training days lead toward the Elementary Pilot qualification. The course includes flight theory and the BHPA exam. 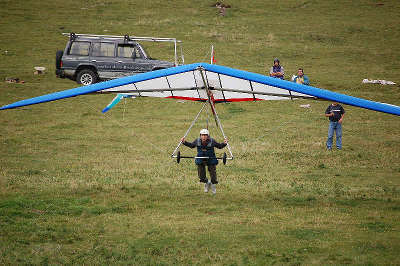 Usually after the first two days the student is ready to fly the glider without the use of tether ropes. These first "solos" are low ground-skimming flights. The aim being to keep the glider flying straight and achieve good landings. Higher flights on subsequent days allow the introduction of deliberate turns and the flying of a predetermined flight plan. The final EP qualifying day sees the student flying high flights with good turns, takeoffs, and landings. Basic theory is tested in the EP exam. All untethered flights require that the student pilot accept that they are "pilot- in-command" and are responsible for the safe conduct of the flight exercise. All equipment is supplied. BHPA membership required: training (3 months £84), or full (annual £128), payable by visa or cheque on arrival. The Elementary Pilot Course costs £795. We need the name of the course participant. Age and weight is also useful to know, but these details can be given later. Contact us to book your chosen dates for training and let us know of any special requirements (training season ... Mar to Oct). Dates can be re-arranged without charge until the final deadline at 7.30pm the evening before when we leave our answer-phone message. Phone our answer-phone after 7.30pm on the day before and listen to the message. Wear suitable clothes and comfortable footwear for the conditions. Bring snacks, packed lunches and (non-alcohol) drinks as needed. 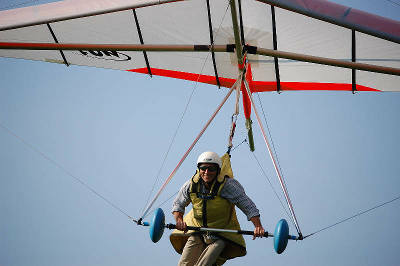 Hang gliding is weather dependent, if your day is canceled you can rebook for another day without charge. Send us an email now .. info@southdownshanggliding.co.uk .. to register your interest or to ask a question or supply further information. Andy Weber. Ep and Cp course. March 2016. Hi John, I want to say a massive THANK YOU again. You, Matt and Rod have done such a great job. Given the fact that I had to travel all the way from Scotland to the South Downs, your great flexibility and your efficient training methods made it possible that I could go through the EP/CP course in just 3 blocks of consecutive days. Even if you had to go with me at three different sites a day in order to find the best conditions. The decision to go with the SDHG school definitely proved to be the right one. Hopefully I'll see you lovely guys again. May be in Spain or Lanzarote. But first let me clock up some hours here in Scotland. Cheers, Andy. Maciej. EP Course. June 2015. John and Matt, I am so happy I have just completed my Elementary Pilot Course. Great thanks for your very professional and yet very friendly and student focused approach reinforcing my strengths and well spotting all my weaknesses. This is how I could progress so fast and safe. Looking forward to my Club Pilot Course at your school. Cheers, Maciek. Kaine Joel. EP Course. 1/5/13. Hi John. Just a quick email to say thanks to you and Matt for all the training and getting me through to obtaining my EP rating. All the recommendations I was given about you guys was spot on, which of course means that I will be in touch to carry on with training and get my CP rating once I have my own glider. Chat to you soon, Kaine. Eventualities.Communications (voice, radio). Responsibility briefing. Un-tethered flights. Maintaining course and airspeed. Introducing turns. Simple flight plans.